What is the Purpose of Workshop Cranes? Our selection of workshop cranes are designed for general industrial use, especially when space is at a premium. Folding workshop cranes do all the work of a fixed model, but they can be folded for storage when not in use, making them perfect for smaller workshops and garages. We offer several different sizes, including 500kg, 1000kg, and 2000kg folding cranes. Each of these cranes allows the user to lift large machinery and other items with relative ease. These cranes are ideal for engine repair and other heavy machinery applications. Where Might these Products be used? 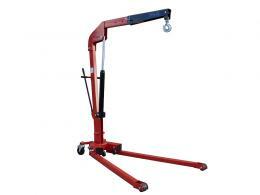 These cranes are especially useful in workshops and garages where space is an issue. The folding design allows the user to store these workshop cranes when not in use. A folded crane takes up relatively little space in the workshop. Even if space is not a major issue, the user can store the crane to clear up floor space and prevent injury that might occur if the crane were left unfolded. Garages, factories, and engine repair environments would be great locations for using this product. Various industrial workers might use these cranes for heavy lifting. Especially employees in workshops and garages who need to work with engines and heavy machinery. 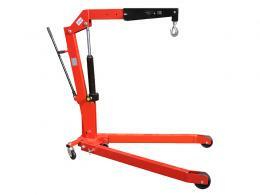 These cranes are available in three sizes, so they might be used in many different lifting applications. Automotive industry professionals, engine repair professionals, and many others might find these cranes useful in their workshops and garages. 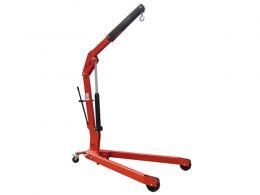 Both business owners and their employees will find this product to be highly durable and very useful for lifting. Available in 500kg, 1000kg, and 2000kg sizes. All sizes fold for storage when not in use. All sizes conform to CE safety standards. A dual action pump provides quick lifting (all sizes).